Now, you might be thinking “but, I don’t usually like Thai food” or “will they be too spicy.” My mom is rarely a fan of anything we order form the Thai restaurant and generally doesn’t love spicy foods BUT I actually just finished emailing this recipe to her because she fell in love with these 15 minute Thai peanut noodles when she was visiting a few weeks ago. You have total control over the spice level too by simply changing the amount of Sriracha and red pepper flakes you use. I like it on the spicy side so keep that in mind when reading the recipe below. 1. Cook spaghetti according to package for al dente. 2. Meanwhile, in a medium bowl, whisk together all of the ingredients for the sauce. 3. Once done, drain the pasta and return it to the pot. Add bell pepper, carrots and sauce. Toss to combine. 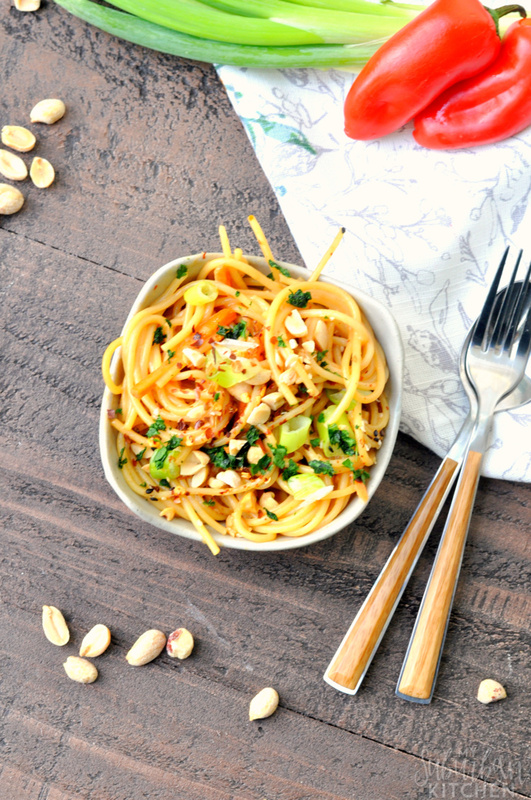 Serve topped with chopped peanuts, sesame seeds and dried red pepper flakes. So, as you can see, that 15 minutes is probably an over estimation depending on how quickly you are with a knife and how fast your water boils. My store actually sells pre-cut peppers and carrots so, when I am in a real hurry, I will pick those up and cut down on the active time for this recipe even more. 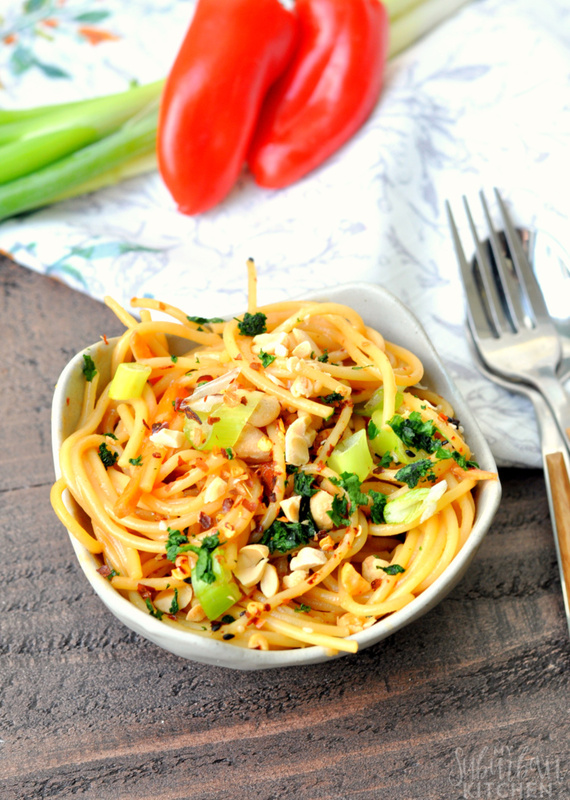 What are some of your quick and easy meals? 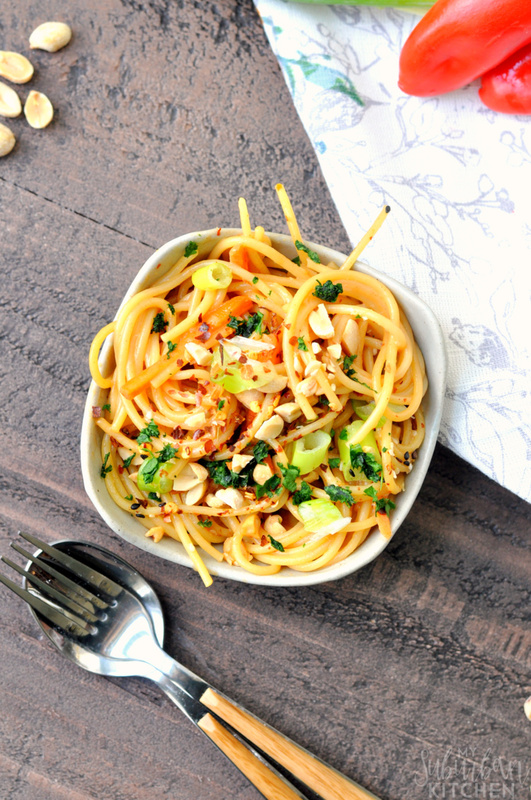 For me, these noodles and my other one pot recipes are always my go tos for busy evenings. it looks amazing. I love noodles and I would taste of them. 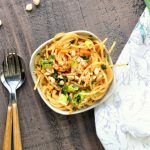 I never used peanut in noodles. it is the first time but its taste so awesome. Thanks! Definitely try it and I bet you’ll love it.